Going to Leeds? Get cheap train tickets to Leeds City train station and save on your transport cost with East Coast railway tickets. 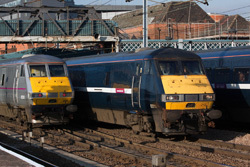 Whether journeying from London Kings Cross to Leeds, or Birmingham New Street station into the heart of England by rail, or off from Yorkshire's biggest city to Scotland, you will be able to check the East Coast Rail Train times too and plan your journey here. Buy ticket for trains to Leeds in advance and save money. The historic Yorkshire city of Leeds is in the very heartland of England, and there is plenty to see and do in the area, especially when travelling using cheap train tickets to Leeds. Leeds is a cosmopolitan city with a variety of excellent shopping centres, restaurants, cafes, hotels and is easily reached by both road and rail. The city is served by a number of network operators, most notably the East Coast Main Line route and Northern Rail, and is perfectly placed to offer excellent links to some of the most impressive and attractive amenities and attractions in England. With great discounts available on rail travel, and some great destinations for rail enthusiasts in the region, this is a great place to explore by rail. Leeds is an excellent city to visit and the attractions are varied and fun.It is only 194 miles north of London and only 2 hours 30 minutes on train from London to Leeds. Harewood House is a superb historic country house with beautiful gardens and much more besides, while the beautiful Civic Quarter is one of the most enjoyable inner city regions in all of England. The city is home to a fabulous sculpture trail, a wonderful attraction that highlights the changing face of Leeds. From Leeds you can take the train to Manchester – a wonderful city in its own right and one with much to offer – and beyond to Liverpool on the west coast, while to the East you can reach the likes of Scarborough and Whitby, then north to Newcastle upon Tyne and Durham. This is why Leeds is so perfectly placed; it lies at the heart of England, and is well worth a visit. The immediate area around Leeds has much to offer tourists, especially those who are interested in the history of the railways and rail travel. North Yorkshire resorts such as Ripon are beautiful cities with stunning architecture and great attractions, but for tourists in the region it may well be the ancient city of York that is the main attraction. York is famous for its many museums, including the wonderful National Railway Museum, the jewel in the crown for rail enthusiasts. To the north west of Leeds you can take a trip on the famous Settle to Carlisle line, ranked as the most beautiful in existence, and there is much more besides. The Peak District and Lake District national parks are within easy reach using cheap rail tickets from Leeds, as are the Yorkshire Dales and North York Moors, both outstanding areas of beauty and fantastic walking regions. Being a central inland part of England the area around Leeds offers stunning scenery and historic sights, and is an increasingly popular place for tourists to visit. The East Coast Main Line website at http://www.eastcoast.co.uk/ offers cheap tickets to all the destinations on the network and beyond, and has a comprehensive journey planner and timetable information. Cheap tickets can be had by advance booking – the further ahead the better – and there is an offer of one third off when booking in groups of three or more, an excellent offer that is well worth considering. The website also offers an innovative points scheme designed for regular users: earning points means discounts in travel – even free offers – and much more. Look out for special offers in conjunction with local events and attractions, and also offers on off-peak travel. This is a network that offers travel right across the country and takes in some of the most beautiful scenery that England has to offer, and cheap train tickets to Leeds may be a great buy.